The Birney is an economical single-truck trolley developed in the 1910's. The design included safety features that allowed the car to be operated by a single person, acting as both motorman and conductor. The Birney car was very popular, in cities both small and large. Small cities used Birney cars because they were economical for a system not needing large cars. For large cities, Birneys were used on lightly travelled lines where the use of large cars, such as the Peter Witt, were not justified. See J. G. Brill Co.
A rail car for carrying both freight and passengers. The controller allows the motorman to change the acceleration of the trolley car. 'Old time' trolley cars were equipped with a 'K' controller, where the motorman stands or sits next to the controller at the front of the car. The K controller is about waist high and has a long handle on top that rotates though points. Inside the controller, each point connects motors and resistors in a certain way allowing the car to accelerate. In newer cars, there are different types of controllers. In the PCC, the control circuitry is hidden under the car and the motorman just uses a pedal to accelerate the car. The Lo-V controller, common in subway and transit cars, looks like a smaller version of the K controller, but only low voltages are used (32V or 36V) to operate high-voltage relays under the car. There is also the Pneumatic Cam Mechanism (PCM) controller where air is used automatically to accelerate the car though points. A doodlebug is any self-propelled rail car to carry passengers or freight. A car that is double ended can be operated from either end of the car. A double end car would be used where there was no provision to turn the car around at the ends of the line. In contrast, see single end. The truck is the part of the car that holds the wheels, motors and brakes. In a double truck car, there are two trucks. Each truck will have two axles and the truck pivits under the body of the car to go around curves. A rail car for travelling between cities. Interurbans can be trolley cars or self-propelled cars. The J. G. Brill Company, Philadelphia, Pennsylvania, was one of the largest manufacturers of trolley cars, trolley trucks and related accessories from the 1890's to 1920's. The company exported cars world-wide. J. G. Brill Co. bought out many smaller manufacturers, such as American Car Co. As the trolley industry began its decline in the 1930's, Brill was eventually bought out by American Car and Foundary. Then, after Brill made the mistake of not adopting the PCC standard, Brill ceased operations in the 1940's. A style of car that is half open and half closed. Named after the Metropolitan Street Railway of New York City which ordered several cars of this type. The photo above is Brooklyn Rapid Transit car No. 788. Maintenance-of-Way: relating to the maintenance of the right-of-way. This allows the operator of the first car of two or more motorized cars coupled together to control all cars. The PCC trolley, developed between 1930 and 1935, became the workhorse of street railway systems. Between 1936, when the first ones rolled into service, and the 1950's when production ended in North America, approximately 5000 PCC cars were built. The PCC was developed by an engineering team contracted by the presidents of several of the nations street railway systems. The PCC is named after the Electric Railway Presidents Conference Committee that undertook its development. Why was the PCC developed? By the late 1920's, small trolley systems around the United States were already closing. Automobiles and competing bus lines were causing rapidly decreasing trolley ridership. The small trolley lines became unprofitable and had to close down. The presidents of several of the largest transit systems remaining in the late 1920's met to decide how to prevent them from seeing the same fate as their smaller counterparts. The decision was to design a trolley that used modern materials, was economical to build, offered high performance and reliability, and utilized a standard design that cities both large and small could use. The resulting research that went into the advanced PCC design was unprecedented in the transit industry. The success of this research and the resulting PCC trolley has been demonstrated in several ways: The number of cars built: 5,000 built in North America and approximately 20,000 cars of similar design built in Europe. Durability: hundreds of PCC cars are still running today, mostly in Eastern Europe. Mr. Peter Witt was the president of the Cleveland transit company in the 1910's. During this era, the most common way to board a trolley car was to pay as you enter*. At times when large numbers of people wanted to board the trolley, a line would form at the door of the trolley as people waited to pay their fare. The trolley car could not move until all people boarded. Therefore at busy times, it was difficult for the crew to maintain the schedule. 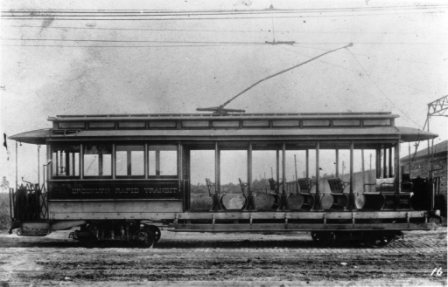 Mr. Witt came up with the idea of a trolley designed so that people could board the car immediately and pay their fare later. The conductor was positioned in the center of the car, just in front of center exit doors. So, when people boarded through the front door, they could take a seat in the front section of the car and pay when they exited the car, or they could pay their fare first and then sit in the rear until their stop. This patented car design became known as the "Peter Witt" trolley and was very popular in cities that needed crowd-swallowing trolleys. The Peter Witt was designed to have a two-person crew: motorman and conductor. Through the 1930's and 1940's when trolley ridership was decreasing in most cities, the transit properties had to ecomomize, so many Peter Witt cars were converted to single-person operation. Usually, this consisted of moving the fare box and/or turnstyle from the center of the car to the front where the motorman would keep an eye on it. Some cities, such as Dallas, went as far as removing the center doors from the cars. (*) Not to be confused with a "PAYE" car, which is another style of car adopted by some systems to address the problem of large crowds boarding the car. A rail bond is an electrical connection between the rails at a rail joint. This allows for the rail to efficiently carry current from a trolley car. Right-of-Way: The narrow property on which railroad tracks run. The St. Louis Car Co., St. Louis, Missouri, in business from 1887 to 1973, was one of the largest trolley car builders in America. A single end car that can be operated from only one end. A single end car is used where the car can turn around at the end of the lines. In contrast, see double end. The truck is the part of the trolley car that holds the wheels, motors and brakes. In a single truck car, there are just two axles, and the truck is fixed to the body of the car. Small windows at eye-level for people standing in a car. The truck is the part of a rail car that holds the wheels and brakes. In the case of a subway or trolley car, the truck also holds the motors that propel the car. Trolley trucks come in two main types, single truck and double truck.